Glutamate is a non-essential amino acid and can either be bound in protein as found in whole commercially unprocessed foods (glutamic acid) or unbound as a free amino acid as found in food additives or resulting from processing (free glutamate, more commonly referred to as MSG). Amino acids are the molecular building blocks of proteins and as these proteins are degraded, the result is the free amino acids, including the neurotoxin/excitotoxin free glutamate (MSG). Glutamate is also the most abundant neurotransmitter, responsible for regulating over 50% of the nervous system, including the sensory system. What is the Importance of Glutamate? Glutamate is considered to be an excitatory neurotransmitter, which means it excites or stimulates nerve cells located throughout the nervous system. The excitatory pathway is responsible for a wide variety of functions like the release of adrenaline, the control of movement and motor systems, learning, memory and the expression of thought. It works in tandem with the inhibitory neurotransmitter GABA (gamma-aminobutyric acid), which calms and relaxes nerve cells. GABA is also imperative for sensory integration, sleep, speech and language. Glutamate and GABA have a relationship similar to a seesaw, when glutamate is high, GABA is low, and vice versa. 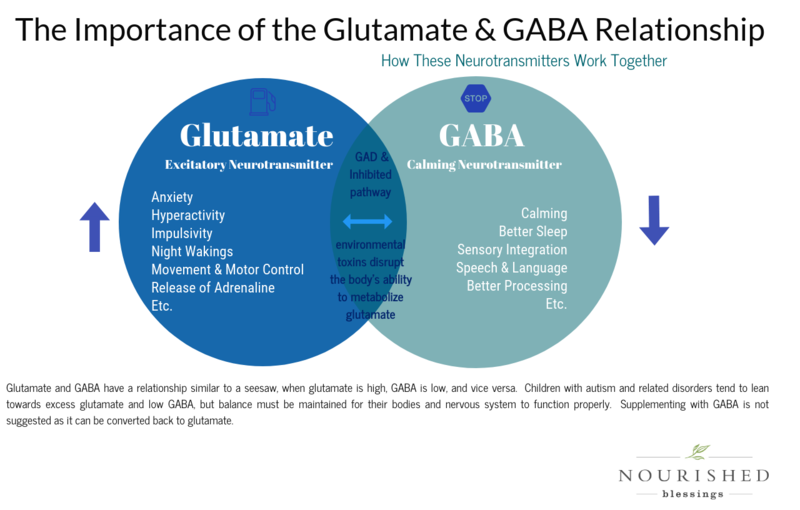 Children with autism and related disorders tend to lean towards excess glutamate and low GABA, but balance must be maintained for their bodies and nervous system to function properly. Supplementing with GABA is not suggested as it can be converted back to glutamate. When glutamate is in excess it is extremely toxic to the brain and nervous system. It can become so excitatory, it is considered a excitotoxin, which means that it overstimulates brain cells to the point of killing them or damaging them enough to cause severe mitochondrial dysfunction (associated with low muscle tone) and neurological inflammation. This neural damage can largely change the way the brain is “wired”. Beyond, the nervous system, glutamate is involved in nitrogen balance, energy balance, and a wide host of cell functions like regulating insulin secretion. Excess glutamate is believed to be involved in a variety of neurological and neurodegenerative disorders including autism, obsessive compulsive disorders, hyperactivity disorders, complex motor stereotypes, tics, insomnia, anxiety disorders, seizures, sensory processing disorder, addiction, depression, chronic fatigue, PANS, PANDAS, Alzheimers, and so on. Elevated levels of glutamate trigger the brain to release endorphins (the nervous system’s natural opioids) in order to protect the brain from damage, which can result in feelings of spaciness and eventually contribute to depletion of your natural opioids. Excess glutamate also impairs methylation and depletes glutathione levels, which are vital for detoxification, controlling inflammation and gut health. What Would Cause Someone to be More Sensitive to Glutamate? Chronic inflammation, microglial activation, autoimmune disorders, neurological damage, poor detoxification pathways, GAD mutations, various toxins, glyphosate, aluminum, mercury, etc. all increase glutamate and signaling. Even various microbes/parasites promote an environment for glutamate metabolism and therefore increase glutamate signaling. Glutamate initiates the inflammatory response, and vice versa, inflammation causes the cells to signal additional glutamate. For example, glutamate receptors reside on many different cell types throughout the body and the number and function of these receptors is dependent on the environment and stress. One of the functions of the cells in our nervous system and in our digestive tract is to report about their environment to our brain and to the rest of the body. These cells (glial cells) report on the gut environment by releasing signals from its cells, and one of its signals is glutamate. So, if it senses a stress response, like inflammation from glutamate itself, it releases more glutamate to send the stress signal throughout the body. Then the glial cells, which are also the cells that are responsible for protecting the intestinal barrier, start to die off. As these glial cells start to die off, it leads to intestinal permeability aka leaky gut due to the inflammation associated with excess glutamate levels. Similarly, microglia are a type of glial cell located in the brain and the spinal cord. They act as the first and main* form of immune defense in protection against foreign invaders in the central nervous system (CNS). When the microglia are chronically activated (either from a single stimuli or multiple stimuli such as vaccines, physical injuries, or chronic underlying infections) they result in disruption of brain function and neuronal loss due to their surge of damaging cytokines and excitotoxic levels of glutamate. For example, exposure to a prolonged viral infection can increase glutamate signaling as part of our body’s response to fighting that infection. This prolonged increased glutamate signaling can make cells sensitive to glutamate where it takes less glutamate to induce a response, compared to an individual with a ‘non-stress’ glutamate signaling response. Some are able to regulate back to ‘normal’ once a perceived invader is gone, however, some cells can take a long time not to be sensitive (chronically in stress response) once a stressor is gone. Several studies have concluded, those with autism and many of the disorders listed above, tend to lean towards excess glutamate signaling. Many see behavioral improvements by following a gluten and casein (class of proteins found in dairy) free diet, which is likely because they are inadvertently lowering glutamate levels and therefore inflammation. Gluten, casein, and to lesser extent, soy and corn, contain roughly 25% glutamic acid as part of their protein structure. In the bound protein, raw and unprocessed form, this amount of glutamate should rarely cause an issue. The issues arise when these proteins are degraded. Some examples are pasteurization, fat removal, fermentation, acid hydrolysis and even occurs to a lesser extent as foods are digested. The protein degradation breaks down the amino acids, freeing up glutamate, leading to a high amount of unbound of glutamic acid (MSG), an excitotoxin/neurotoxin wreaking havoc on the nervous system. This can especially be problematic if you have leaky gut, allowing for free glutamate do directly cause damage. However, one doesn’t need to have leaky gut to be sensitive to free glutamate, as we have glutamate receptors in our digestive tract that have the ability to signal additional glutamate. Gluten and casein are not the only concern. The FDA only requires ingredients over 99% free glutamate to be listed as MSG. Therefore, anything under 99% free glutamate doesn’t have to be identified as MSG and can be hidden or disguised in well over 50 different names. MSG and its various names are simply added to our foods to provide a competitive edge over other manufactures by making food taste better and more addictive. These names can be as innocuous and deceptive as “natural flavors” or “spices”, leaving the consumer completely unaware of their neurotoxic properties.